In the New Testament, the first character we encounter is John the Baptist. This well-known preacher announces the impending Kingdom of God and prepares the way for the ministry of Jesus. John’s audience listened expectantly, wondering if he was the Messiah (Luke 3:15), although he made it clear he was not (John 1:21). John is not a Christian preacher, but rather a distinctly Jewish voice which expresses an understanding of the coming kingdom in Jewish terms, relying on the vocabulary of the Hebrew Bible and the Jewish religious world of early first century Palestine. John is therefore an important witness to Jewish messianic expectations at the time of Jesus’ ministry. The historicity of John the Baptist is rarely doubted. As John Meier describes him, John is a “wild-card” in the Gospel tradition and all four gospels struggle to “make John safe.” (A Marginal Jew 2:19-22). He is an independent prophet who preceded Jesus and had a following which might be described as a rival to Jesus’ ministry. He was so respected by the Jewish people that after his death he was still regarded as a prophet (Matt 21:26) and still had disciples well after the events of the gospels (Acts 19:1-6). That Jesus submits to the baptism of John is certain – the writers of the four gospels would not have created such a difficult problem for their own theological aims. John himself does not become a disciple of Jesus and it seems he doubted Jesus was the coming Messiah. In Matt 11:2-3 (cf. Luke 7:18-20), John sent disciples to Jesus to ask him if he is the “coming one” or if they should expect someone else. Does this imply that John had second thoughts about Jesus? Jesus does not condemn this as a lack of faith, however, he praises John as the greatest of the prophets and associates him with the coming prophet of Malachi 3:1; 4:5-6. John is so significant in the synoptic gospels that his death is recorded in all three synoptic gospels (Mark 6:14-29, Matt 14:1-12, Luke 9:7-9). Even after his death, John still commanded the respect of crowds at Passover who still regarded him as a prophet (again, all three gospels relate this tradition: Matt 21:23-37 / Mark 11:27-33 / Luke 20:1-8). A few disciples of John are mentioned in Acts 19, nearly 30 years after their master had died. When Paul meets these disciples, they claim to only know the “baptism of John” and do not even know that there is a Holy Spirit (Acts 19:1-7). What was so compelling about John’s preaching that he gathered disciples who continued to following him long after his death, perhaps even rejecting the preaching of the disciples of Jesus? First, John’s preaching was drawn from the Hebrew Bible and declared that the Messianic age was about to begin with a fiery judgment. This is one of the most common messianic expectations in the Second Temple Period and it was popular because many who were looking forward to a Messiah expected him to deal with the nations oppressing God’s people. Second, there may have been some dissatisfaction with Jesus’ version of the Kingdom of God. The idea that the Messiah would become the suffering servant and die on behalf of others was not a common view. In fact, claiming that the Messiah would die to take the curse of the Law on himself is virtually unique to Christian preaching. For the disciples of John, then, it is at least possible that the rejected Jesus and his disciples because these new “Christians” misunderstood the Messiah. Is there a contrast between John’s preaching and Jesus with respect to the Kingdom? Is it possible that John was looking for something different than what Jesus ultimately offered as a Kingdom? There is certainly understanding of Messiah’s mission when John proclaims early on “”Behold! The Lamb of God who takes away the sin of the world!” Some insist this was a prophetic statement that John did not understand but the lamb as sacrifice seems unmistakable. Yet, even Jesus own disciples rejected this teaching before the cross. Yea! Phillip’s doing my second favorite NT figure of all! Love JTB, and I have all the sympathy in the world for his poor old disciples. What John himself thought, at various points, is the more complicated question. As for the disciples, I have long believed it’s actually fairly simple. They were addicted to being divinely exceptional. Whatever else they said, thought, believed or taught, the predominant factor was their experience. Whatever else they were succeeded or failed at, these disciples had been on the cutting edge of THE work that God was doing in their “generation”… at least for about a year or so. The saddest fact was that they *knew* that they had been in such a work. My theory is that all but one of them (Andrew) simply refused to let go of that specialness. This happens to people all the time, when they *know* they’ve had a true and real and profound experience of being led by the Lord… and then they worship the memory of that experience, and build an altar to it, and preach about it for decades thereafter. The Kingdom of God must be an active King-ing by God. The fact that we can so easily forget this crucial distinction is at least one thing that JTB and his disciples illustrate, albeit each in their own way. Glad to see you commenting again, if I had know John the Baptist was all it took I would have posted this earlier! Obviously it is impossible to prove, but I wonder if John remained interesting because he tapped into that growing apocalyptic fervor that resulted in Revelation, 4 Ezra and 2 Baruch (among other apocalypses), but also because he demanded a kind of righteousness that was at the heart of the Law, like Jeremiah or Amos. I suspect that people who wanted to remain faithful to Judaism and believe in Jesus as Messiah could have kept John’s teaching / preaching alive, perhaps the Ebionites or some sort of proto-Mandean group. I will be honest and say that I have never thought a negative thought about John the Baptist. Sunday school gave me a general understanding that John was a rather good guy and did next to nothing wrong while “preparing” the way for Christ. Although,could it be that John was angry at Jesus? I have no doubt that John believed Jesus was the Messiah, but John, like most Jews, was expecting Jesus to blow over the Roman Empire. When Jesus went about his business and loved everyone instead, maybe John got angry and began teaching his disciples, out o anger, that Jesus was not the Messiah. I never thought that in John’s preparing the way for the Messiah he didn’t necessarily have to believe that Jesus was the Messiah. I always just assumed that John knew and believed that Jesus was the Messiah. I mean, John baptized him and a voice came from heaven… that would be enough proof for me (I hope). But looking at your first few points, he didn’t necessarily have to believe that it was Jesus, so I suppose he might not have. In John 1:29 John doesn’t only proclaim the Lamb of God who takes away the sin of the world, but the verse says that John said it while Jesus was coming toward him. This makes me believe that John did know Jesus as the Messiah. But to answer your final question, I think most expectations of the Kingdom of God were according to the Scriptures and though Jesus fulfilled all the prophecies, it was in a different way than any of them had expected or perhaps interpreted. He was a King, and the rightful King of the Kingdom of God that he was establishing, but people expected a more earthly King and Kingdom. At the least they didn’t expect the king to die on a cross, what kind of kingdom would a king like that be establishing? Not one they would want to be a part of. John’s preaching was most likely accepted and followed because Jesus’ Kingdom was different, hard to fathom, and hard to accept. John’s Kingdom was strictly a Jewish Messianic interpretation of what was to come. If I were a Jew, I would listen to John’s preaching that more clearly aligns with the scriptures that I know to be true, rather than Jesus’ claims that are rather different and more outrageous than the Kingdom I was raised to know, expect, and pray for. The Jewish expectation was for the Messiah to come as a military leader and to go out and fight against those nations, as he fights on a day of battle (Zechariah 14:3) and for Him to be king over the whole earth (Zechariah 14:9) and I believe that was similar to and basically John’s expectation of the kingdom. But Jesus preached a Kingdom without division (Mark 3:24-26), a Kingdom of healing (Luke 9:2), and a Kingdom in our midst (Luke 17:21). Luke 17:21 I believe is one of the key differences in the Kingdoms they were preaching, Jews wanted to pin point what and when the Kingdom would happen, but Jesus explained that they couldn’t do that because it is in their midst. That was an error for them, they definitely thought the Kingdom was going to be something that would happen in a way that they could grasp and put into their own terms, when it wasn’t. As far as what John was looking for besides what Jesus was, perhaps John was looking for a strong leader whom everyone accepted, but I am not really sure what you have in mind. I would love to know. As little as I contributed, I think I have nothing else to attempt to add or poorly elaborate on. Grace and peace. I do not think that there was a contrast between the preaching of John and that of Jesus. Maybe sometimes we just end up interpreting it that way. In Luke 1 the birth of John is told. It is said in verse 15 that he will be great in before the Lord and that he will be filled with the Holy Spirit at birth. I do not believe that someone that God specifically chose to prepare the way of Jesus could have a majorly contradicting preaching of the Kingdom. I guess due to sin nature it is possible for the preaching either to be skewed or look skewed to us. The fact that the people were expecting a “fiery judgment” and no death of the Messiah may only be misinterpretation on their part. They may have expected it at that specific time in history, but in reality God is not bound by time so having John and Jesus saying it is “at hand” could mean now to us, and thousands of years to God. Or the fact that He wasn’t supposed to die, well technically He did but He rose again and had life. So, His death was not all loss as some Jews may have seen it as, in fact it was all gain. I also do not think that the action of John the Baptist asking if Jesus was really the Messiah is any indication that he didn’t really believe that it was him. He was just using wisdom about who was the true Messiah instead of believing just anyone that claimed to be. I had never before considered the possibility that John the Baptist was not a Christian preacher but was merely a “distinctive Jewish voice” and a “well-known preacher.” I always assumed that since he preached the Kingdom of God and warned of the coming judgment that he not only was a Christian preacher, but that he also knew who Jesus was. When John baptizes Jesus, he acknowledges that he is unworthy of baptizing Him. From reading that passage, I had always previously assumed that John knew he was baptizing the Messiah. Yet, the people had assumptions that John himself was the Messiah, even though he told them that he was not. Did John merely think of Jesus as a good prophet that healed the sick and taught the people valuable Biblical truths? Is this why he considered himself unworthy to baptize Jesus? John also acknowledges that he is paving the way for the Messiah who will come. He tells the people, “I baptize you with water. But one more powerful than I will come, the thongs of whose sandals I am not worthy to untie. He will baptize you with the Holy Spirit and with fire” (Luke 3:16). John had such a reverence and respect for the Messiah to come, yet did he not even recognize Him when he baptized him with his own hands in the Jordan River? And when the Spirit of God descended like a dove and spoke to Jesus, what was the reaction of the people and of John? Is it possible that the voice was only audible for Jesus? If everyone heard the voice, how could they not all acknowledge right there that Jesus was indeed the Messiah that they had been waiting for? Was he so completely different from all of their expectations that they were not even prepared for him and missed it all together? Was the kingdom that John the Baptist preached different from the kingdom that Jesus preached? I do not understand how the two could be different considering that John was sent by God to pave the way for Jesus’ ministry. As prophesied in Malachi and reiterated in Luke 7:27, “I will send my messenger ahead of you, who will prepare your way before you.” If John was considered worthy enough to pave the way for the Messiah, would he not have known the Messiah or at least recognized him when he came into contact with him? Yet he still sent the disciples to question Jesus and ask if He was the “coming one.” It is amazing to me how easily these details are overlooked and assumptions are made. I am interested to hear other opinions on some of these questions. Any thoughts? I have never realized that John the Baptist did not believe that Jesus was the Messiah. That makes one wonder and think, what did John the Baptist believe then? Because he was not a Christian speaker, though he taught Jewish ways, I would assume that John the Baptist would at least have the knowledge of Jesus being the Messiah. It does make sense to see that the people did not believe that it was even possible, but for a man to preach the good news and not believe that he is the Messiah is a bit cloudy for me. Who knows what John was thinking when it came to “what Jesus ultimately offered as a Kingdom.” I am not sure it matters since it was believe that John the Baptist did not even believe that Jesus was the Messiah. From all of the things Christ has done, I would hope that John would see and understand who Jesus Christ is and why he was there. It amazes me that from all the miracles that Jesus has done, that John could have had a different idea. I guess I want to back down a little here, before things go too crazy. I think John did believe Jesus was messiah, But when he was in prison wondered if Jesus was in fact the messiah. There is a shred of doubt, but I do not want to imply he was an “Unbeliever”. It’s evident that John was the one the prophet Isaiah spoke about. The words Isaiah spoke is an indicator of this as well as the inspired Word of God clearly stating it. So there is no doubt that John the Baptist was the one who was to prepare the way. And there is no doubt that he was doing exactly that by preaching repentance for the forgiveness of sins (Mark 1:4). John also acknowledged that there would be one greater to follow him (Matthew 3:11). And it seems like he acknowledges Jesus as that individual who is greater than him in his initial refusal and eventual consent of Jesus’ water baptism (Matthew 3:13-15). Now there are a couple of reasons why I believe there was little to no contrast in John and Jesus’ preaching of the kingdom. I’m sure their teaching wasn’t identical, but in respect to the Kingdom there are obvious similarities. One being that they both preached the confession and repentance for forgiveness of sins. Another reason being that Luke 3:18 states that “John exhorted the people and preached the good news to them”. Good news here in this verse in the Greek language is euaggelizo meaning that John the Baptist was preaching the gospel to people who came to him from Jerusalem, all of Judea, and the whole region of Jordan. Now there is a strong possibility that John had similar expectations to those of other Jews. This assumption is based off of his doubting Jesus being the Christ. Therefore it is also a possibility that John preached to his disciples his own expectations, which apparently for the most part were not the same as Jesus’ expectations of himself. It’s interesting to me that Jew’s didn’t take into consideration the prophecies regarding the Messiah and the sacrifice he will make, being sneered and mocked at, pierced through hand and feet and finally crucified. Having said that, I believe John and Jesus’ preaching of the Kingdom was generally the same, especially regarding what John had to do to prepare the way, even though John may have had different expectations of a Messiah. I think it is very possible that John the Baptist may have been looking for something different than what Jesus ultimately offered as Kingdom. I say this because of two reasons. The first is the little bit of doubt that John has in Luke 7. The second reason is that John’s followers do not seem to associate with Jesus’ disciples. Why would they not embrace Jesus as the Messiah? After reading many of the comments on this post, I think that it is important to remember that John the Baptist, although he may have had some doubt, was the one Jesus referred to as the prophet to prepare the way. Malachi 3:1 says, “See, I will send my messenger, who will prepare the way before me.” If John is that ‘messenger’, his message had to have been similar to Jesus’ message. His call for repentance matches Jesus’ call for repentance. However, I do think that John’s expectation of the Kingdom was a little different. “While Judaism saw the eschatological kingdom coming at the end of the age, when God would defeat Satan and usher in the age to come, Jesus proclaimed that God was acting now to reveal his kingdom and defeat Satan” (Strauss 439). Many expected Jesus to come and change things in a much more radical way. Instead, right after being baptized by John, Jesus went to the desert for 40 days. And after that He did not overthrow the government, establish himself as ‘king’, and pronounce judgment. I think that maybe John and his followers believed Jesus was the messiah to some extent, but they were being careful not to follow just anyone. As we read in Simply Jesus, there were many who claimed to be the ‘king of the Jews’, so it would make sense that they would not want to immediately follow Jesus for fear of him being another ‘fake’. It would be interesting to see what John’s followers did after the death and resurrection of Christ. Is there anything about that in Scripture? John did not come to “follow” Jesus, but to come before Jesus, to prepare the Lord’s way. As for John’s faith, he did not always doubt, but we do not know if he died doubting, or trying still to believe. My bet is he struggled, but held his eyes up to heaven. I can say this much, quoting the Lord. Among those born of women, there is none greater than John. And – according to the 4th Gospel (implicitly & contextually) – Jesus said this *after* John’s death, not before. Good point, and I want to emphasize that we are not talking about the question, “was John saved” in the modern, evangelical sense of the word. He was, according to Jesus, the most righteous of that age. Even though he is the “least” in the kingdom, this is high praise indeed! Perhaps we ought to avoid imposing our theological categories on John. no one in this group of commentators has thought to remember that John is the cousin of Jesus. Of course he “knew” who Jesus was. Mary was just barely pregnant with Jesus when she went to her cousin’s house and stayed there for 6 months until John was born. Mary told her cousin that the angel of the Lord came to her and impregnated her. She told her cousin she was still a virgin and you can’t tell me that John and Jesus didn’t grow up knowing about each other at the least and actually knowing and playing together at the most. John heard the stories about his cousin Jesus who was the son of HaShem. What a stigma to live, being raised as the son of God. Be careful you never get hurt. How many critters, animals, pets, friends did Jesus perform miracles for as he was growing up? We’ll never know but he had to learn about his gifts. John no doubt heard all of the stories. The only reason he asked if Jesus was the Messiah to come is that he knew his cousin and by asking this, he could give Jesus a way to get out of everything. Plausible deniability. If Jesus had decided to say no, I’m not going through with all of this, then John could say, well, the Messiah hasn’t come yet. It does not seem unlikely that John would have doubts about Jesus as Messiah. If, even at the baptism, John was quite sure that Jesus of Nazareth was the long awaited Messiah, that certainty could have easily been lost as Jesus continued in his ministry. We see John the Baptist as a strong force and representation in the world of first century Judaism of what the people expected in God’s provisioned anointed one. One cannot assume from John and Jesus’ exchange prior to Jesus ministry that John’s expectation for a messiah were any different than those expectations from one or more of the various religious sects. I see no reason why John would not expect the military and/or priestly Davidic ruler, which were the two main opinions on the matter. He would not have expected Jesus to do what he did (or what he did not do). All this said, I do believe that John the Baptist did indeed believe Jesus was the Messiah. That is affirmed by John’s prophetic giftedness as well as his feeling unworthy at baptizing Jesus (Matthew 3:14). I would therefore disagree with any of the above commentators who might deny John’s knowledge of Jesus as messiah. However, I can understand seeing it as unnecessary that John know that (even though I don’t believe that myself). Maybe “rival” wasn’t the best word to use, but what Meier was trying to say was that there were two messianic movements which people could “join,” Jesus or John. John does not see himself as a rival, he is preparing his disciples to join Jesus. But it is odd that not all do join Jesus, making two groups which are proclaiming that the kingdom is near/ at hand. This concept is very interesting to me. I’d always seen John as a certain supporter of Jesus and as I read and continue to grow in my understanding I see how that was not entirely the case. I would agree that John the Baptist probably did have a different expectation of what the Kingdom was going to be and who the messiah was going to be. I’m certain that John knew that Jesus was the messiah on some level (Matthew 13:14) I believe one of the biggest factors in the moments of “doubt” for John were tied into Jewish expectations of Jesus and the kingdom. Jesus was likely not what John thought he would be and at times I’m sue things Jesus said and did confused John causing him to question Jesus. I was very confused as i read through this article. The question of whether or not John believed the Jesus was the messiah had never crossed my mind before. I had always just assumed that his purpose was to lay a path for Jesus and that he knew that Jesus was the messiah the whole time. Jesus never fully admitted that he was God though, so i understand how puzzled John may have been. I do not think that Jesus was the ruler that he saw coming. Like Jared stated above he may have expected a more military minded ruler coming. From what is presented from John and Jesus, there is a difference to be seen. Although John accepted Jesus as the Messiah, he didn’t initially. So it can be rightfully assumed that he had slightly different ideas about the Kingdom of God. But also there were some similarities between the two of their teachings for the Kingdom of God. John the Baptist prepared the way for the coming Messiah; Jesus called him the greatest of the prophets. John was obviously doing something right. His teachings are that of distinct Jewish teaching and knowledge. So then again we can assume that he could have thought some a little different as to how Jesus in his mind was going to approach the situation and manner in which he came. 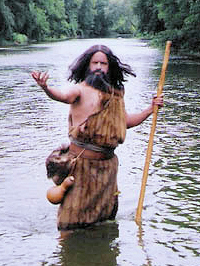 And John the Baptist had followers that after his death that were approached by the apostles, who didn’t know what the Holy Spirit was; when J.t.B specifically said in Mark 1:8 “I have baptized you with water, but he will baptize you with the Holy Spirit.” I like what you said Professor Long about “there may have been some dissatisfaction with Jesus’ version of the Kingdom of God. The ides the Messiah would become the suffering servant and die on behalf of others was not a common view.” Even though John was a good teacher he was still Jewish and must have thought have thought this idea was odd. I guess I wouldn’t really know what else what to say regarding if John the Baptist had second thoughts about Jesus. I do not think that it would be too far off to say that even John was looking for something a little different than what Jesus was offering and the things He was doing. John, like any other good Jew, was more than likely looking for a Messiah that was going to establish the kingdom right then and there; with a noticeable entry as well, not how Jesus came. The Jews believed the Messiah would bring justice to all the wrong that had been done, and the people who did it. Instead, Jesus came humbly, helping and serving those of a “lower” status. I’m sure this confused John just as much as it did all the other Jews. I also never really thought of how difficult it might have been for the writers to write about John and Jesus and the baptism. I always just read it and tried to figure it out, but it never occurred to me that they would not have just put it in there for “fun”, but that they may have struggled with the theological meaning behind it as well. John was always a significant person to me because he went before Jesus, but I never really considered just how crucial of a part played, especially seeing that his accounts are written in the synoptic gospels and there is not much of a variation. I’d like to draw attention to the fact that John was a prophet from God, who had secrets revealed to him by revelation, not just an average Jew living in the culture like all the rest. So I do think it’s a bit difficult to say that “this confused John just as much as it did all the other Jews.” However, I admit you could reasonably make the case that perhaps God did not reveal all the intricacies of the coming Messiah to John at the time of his preaching, just instead showed him what to say. I guess even prophets were still human, not omniscient, and we can never be quite sure exactly how God spoke through them. Yes, I agree, that is a really interesting point! I think these types of observations are some of the coolest little tidbits that can add to the already-impeccable reliability of Scripture. Another example of this is the Gospels’ testimonies that “many of his disciples turned back and no longer followed him” (John 6:66) at one point in his ministry, and that after He was arrested, “all the disciples deserted him and fled.” (Matthew 26:56) They definitely did not include that fact to establish popularity for their message. This is not some made-up story to make Jesus out simply to win followers to their cause or to prove Jesus to be God, but instead a real story intended to speak truth. To say that John “was looking for something different than what Jesus ultimately offered as a Kingdom” (Long), I think, is to say a falsity. The Bible says that the prophets were God’s spokesman, given visions, dreams and words from the Lord to communicate to His people (Heb. 1:1, for example). To say that John said or “was looking for something” that was contrary to what was actually going to take place is to look at the issue from a very humanistic perspective, discounting the Holy Spirit’s role in the prophecies. Either that, or it would be saying John if a false prophet. (Deut. 18:22) But this cannot be, because Jesus himself said that “there is not a greater prophet than John the Baptist” (Luke 7:28). I think that John’s predictions of coming fire and judgement contrasting with Jesus’ teaching of a suffering servant could be an example of the already/not yet concept. John says, “But one who is more powerful than I will come, the straps of whose sandals I am not worthy to untie. He will baptize you with the Holy Spirit and fire” (Luke 3:16), and Jesus comes to serve. John isn’t worthy to untie his sandals, but he is worthy to baptize him? It seems that John’s statement, “One who is more powerful than I will come,” has come to pass, but the realization of Jesus’ true authority and power will not come to pass until his glorious Second Coming.